1. Run mission editor (missioned.cmd in WarThunderCDK folder). 2. Choose Scene view tab and load one of game levels (it is location "britain" by default) where you want to create your mission. Note: Missions can be technically run on an location, choosing location scene is just a preview. 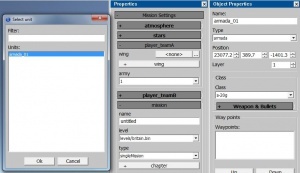 Choose in the side toolbar Mission Settings -> mission->level the same location you chose in scene view Choose a name for your mission that will be displayed to the players(localization for mission name will be saved to a separate CSV file) Choose other settings - time of a day, weather, mission type and campaign name. Localizations are are saved in CSV format (separator - ;) in the same folder with necessary prefix “usr_”. Mission is available to view and test in main game menu, in “user missions” section. Attention: To test user missions you should have the aircraft that is used in mission bought.